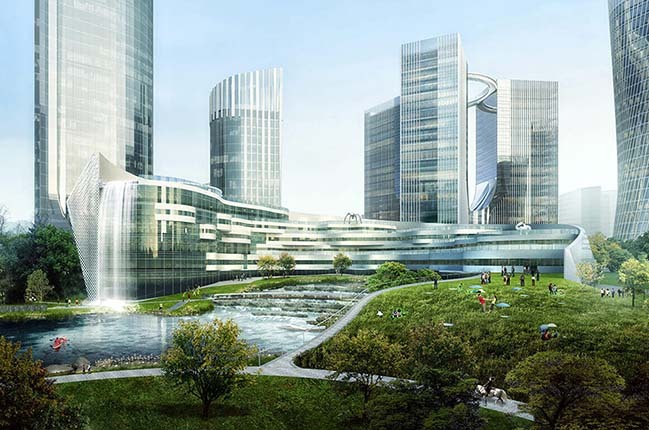 The masterplan by Progetto CMR envisions a new way of conceiving the “Big Data” industrial zone, mixing the strength of the high-tech and IT with a full range of facilities, creating a self-sufficient district. 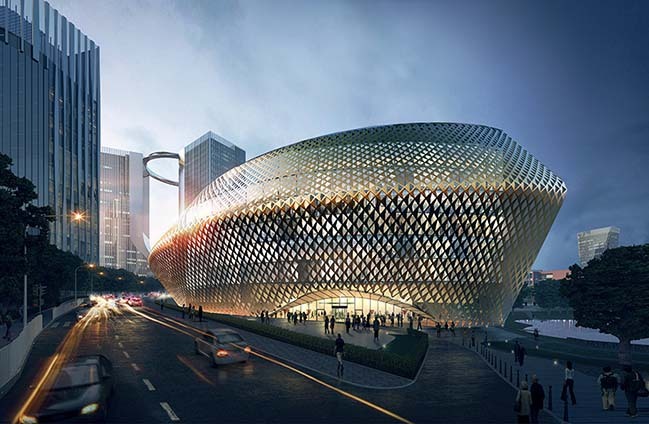 Client: Xiantao Big Data Valley Corp.
From the architect: The intent of the design is to build an advanced community, ready to accept and to win the challenges of the new era of the Information Technology, while being entirely focused on the Man, true protagonist of the project. 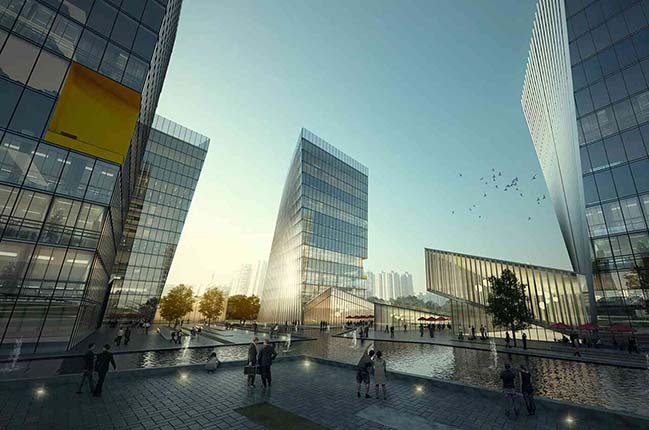 The project thus includes an area dedicated to office and Big Data production, integrated by SOHO apartments, commercial and retail area, schools, a luxury hotel and other facilities to improve the life of the people who will live there, on a total area of 260,000 sqm. 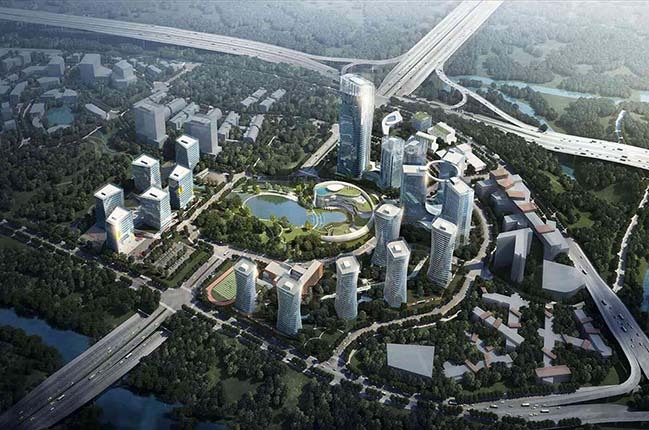 The project is equally dominated by large green areas, parks, lakes and gardens, mostly located in the heart of the area, enhancing the livability of the district and the well-being of its users. 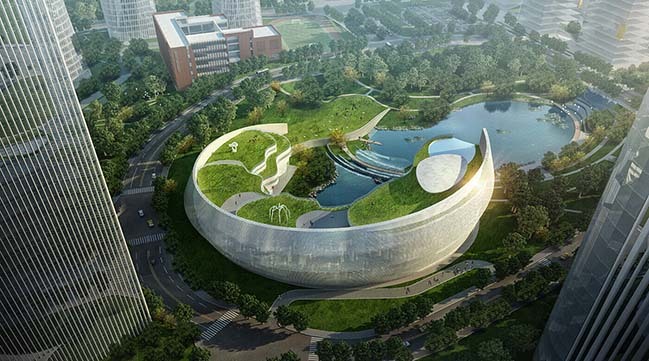 The masterplan of the Xiantao Big Data Valley, now under construction, arises from the strong intention of the Client to see its core business, the big data, shaped into buildings, passing from purely abstract entity to a solid and touchable reality. This is particularly visible in the landmark of the project, the three-building complex that stands for the three core basis of data processing – Storage, Sensing, Data Mining – and which will be the main office complex of the project area. A simple and neat shape characterizes the three pillars, whose glass façade further reinforces the contemporary feeling of the complex, a thin and transparent wall between the real and the virtual world that is in the towers. The three buildings are symbolically united at the top by a circular structure, which works as exhibition space where visitors can enjoy a powerful view on the surrounding area at a 100m height, while immersed in a space that recalls the constant and unstoppable flux of data. The same visual experience, although through different ways of expression, is also offered by the SOHO and the Office loft complexes. The five SOHO buildings, located just on the side of the landmark complex, have five different heights, a harmonious crescendo that ends in the three-tower complex, a series of twisted and rounded shapes, dressed with glass, that give movement to the whole project. The office loft area lies at the front of the SOHO and it counts 6 buildings designed as rigid sculptures, with facades that are cut out in different angles, as the buildings were completing each other. Contrasting with the rationality and vigor of the close buildings, the 5-star hotel is designed as a smaller and more intimate element, shaped according to the natural slopes of the land where it is located. The hotel embraces the lake and the large green park in front of it: on this side, the building is open and transparent, thanks to a large glass façade that runs from one side to the other, creating a parallel world where the only sound is the one of the waterfall that from the rooftop of the hotel runs into the lake. On the backside, the façade is a metal double-skin façade, that closes the hotel and further isolates it from the vibrant life that flows outside.